Interesting article. 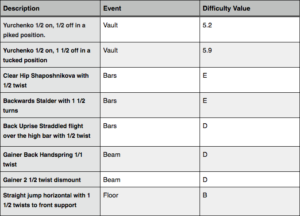 I think it\’s really difficult to compare gymnasts across such different quads and against a different code of points. Biles may never have done well under the 10.0, while the same could be said for Sveta under open-ended scoring. Maybe it\’s best to go with a tennis type approach and leave gymnasts not being compared across 10.0 vs. open-ended unless they overlapped during that period? This debate will probably never end UNLESS Simone did compete across two full quads and finds herself at another Olympic games. Maybe too early to tell? I think this is an accurate assessment of their respective legacies. Svetlana never performed to her full potential at the Olympics. Simone did. There is no question that the Olympics are a bigger stage than worlds. I think if you are going to rank people, you need to take that into consideration. Svetlana is a great champion, but she never won the Olympic all around. We must take that into consideration. Where does Nadia rank in here? Remember, Nadia NEVER won an All Around at Worlds. She won all kinds of Event Finals, but never that All Around. Simone, on the other hand, won the AA not once, but FOUR times. So, if you’re looking to rank Nadia V. Simone, Nadia would be the loser in that case. Remember, Nadia never won an All Around at the Worlds she was at. Elena Mukina beat her in 1978, and, if I’m not mistaken, Nelli Kim beat her in 1979. So, Nadia didn’t have any good luck at Worlds. She won lots of event finals, but that All Around was elusive. Simone, on the other hand, won the AA THREE times at Worlds. If she was competing right now, (and training) she’d probably win Worlds RIGHT NOW. The kid is GOOD. I think this conversation is pointless because Simone hasn’t announced a retirement yet, so you can’t compare careers. I wouldn’t be surprised if she did. Competitively she’s done almost everything a gymnast can do and being all-around Olympic champion is basically the pinnacle. If she did it back to back there would be no question. As a gymnastics fan, I love them both and loved watching each of them compete in their eras. If I had to decide, I’d pick Simone. The fact is, with her it’s mostly not a competition. Khorkina was one of the greatest, but others could catch her, even on her best day. No one ever said “5 Gold medals” leading up to an Olympics with Khorkina, and she never won 3 individual gold medals at an Olympics. World Championships are just as competitive as an Olympics, but they’re not the same. No one knows what will happen with Simone in this next quad, so I’d save a definitive answer for the upcoming years. To me, the \”greatest ever\” discussion cannot be dependent only on longevity (then Chusovitina would be the greatest ever!). Also, there have been many gymnasts who showed up quickly, were dominant for a short time, but then didn\’t endure (i.e. Gutsu, Shawn Johnson). 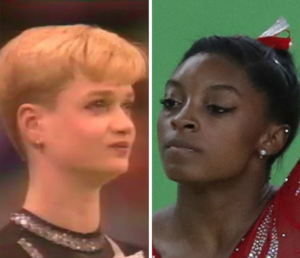 The test of true greatness should be \”extended dominance\”–which both Khorkina and Biles have shown. Over an 11 year career, Svetlana won 3 all arounds (impressive indeed). Biles winning one more than that doesn\’t impress me as much as her being undefeated during a four year run–Svetlana can\’t touch that. Also, Biles has as many individual medals in one Olympics as Svetlana had in three games. It\’s not about the numbers so much, but about the dominance, and to me there is no question that the extended dominance of Simone was of a caliber that Svetlana\’s dominance never showed.